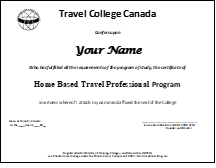 Our Home Based Travel Professional program is ideal for new agents and those who appreciate value in skills upgrading. Build your knowledge – Build your business. Well-rounded course content has been carefully designed to include “must know” essentials for a Home Based Travel Professional. Knowledge delivered through the program increases one’s self-confidence, which results in higher sales and successful business. On average, allow about 160 hours to complete studies, research, Assignment, and Test. It is recommended the student dedicate 8 or more hours per week to finish within 20 weeks (5 months). If more time is needed, the student may email our office to request program extension. C$975.00 includes Theory Notes, Assignment, Test, and Certificate upon successful completion (average grading of 70% or higher.) for online email pdf format. For those preferring hard copy (binder) format, please add C$55.00 for mailing costs to the program fee of C$975.00 for a total of C$1030.00.